Have you ever been tired of waiting in a long queue at the coffee shop for an expensive cup of coffee? With this stainless steel coffee filter, you can brew a cup of coffee in minutes at home or in the office. The process of making a cup of good tasting coffee couldn't be easier. Put the grounds in the cone, pour hot water over the grounds, let the water drip through. Then enjoy a cup of fresh coffee! There shouldn't be a compromise when it comes to your coffee, and enjoying a cup of coffee shouldn't be a pain. Our Tai-ying coffee cone dripper is made with a dual filter, twill weave method to ensure the best brewing without any clogging or the annoying papery taste. 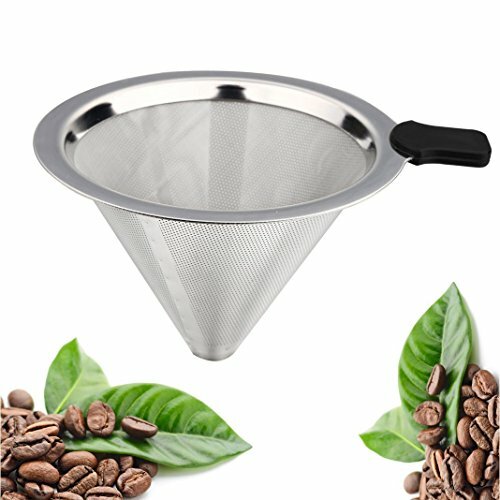 The 304 stainless steel coffee filter is specifically designed to make sure that all the delicious flavored oils from your grounds are preserved into every cup so you can fully enjoy your coffee! The honeycomb pattern design of outer filter enhance the sense of beauty and taste. 1. The reusable coffee filters 4 cups is reusable and fine enough to filter 99.9% coffee grounds. 2. The stainless steel permanent coffee filter make coffee that has a bolder and fresher taste. 3. A perfectly brewed cup of coffee doesn't come from a plastic cup or paper filter. 4.The stainless steel coffee dripper provides you a hassle-free, permanent and reusable solution to brew high-quality pour over coffee without the need to ever buy paper filters again. Eliminates paper waste, saves a lot of your money and makes a great contribution to environmental protection. If you have any questions about this product by Tai-ying, contact us by completing and submitting the form below. If you are looking for a specif part number, please include it with your message.